While the Pekingese may bode a fluffy fur coat and adorable face, they are not the timid small lapdogs that they appear to be. Not a cowardly dog, they have a tendency to defend themselves when deemed necessary, but they will not instigate a fight. They can be outspoken, but generally are very playful creatures. Their playful nature can be plenty for their adult caregivers to feel content with, but they may be less active to keep up with a group of children. They are well known for being rather stubborn and they make exceptional watchdogs. The Pekingese may not be friendly toward strangers as much as their owners would like them to be, but they are very caring toward other pets. Not the easiest dogs to train even as pups due to their stubborn emotions, but they are affectionate! One thing all Pekingese canines enjoy is walking with their owners. A warning for all owners of these dogs is to always monitor them when they are outdoors in very warm temperatures. Pekingese pups are not a good breed to have outside when it is very hot as they can actually pass away from excess heat exposure so do not ever leave this type of dog in a vehicle to run errands. They are the ideal canine for someone residing in a small space such as apartment living. They bode a very bushy and full fur coat that has a tendency to become matted if not cared for properly. A good rule of thumb is to groom their coats at least once per week. They can be noisy sleepers and do generally snore quite often. 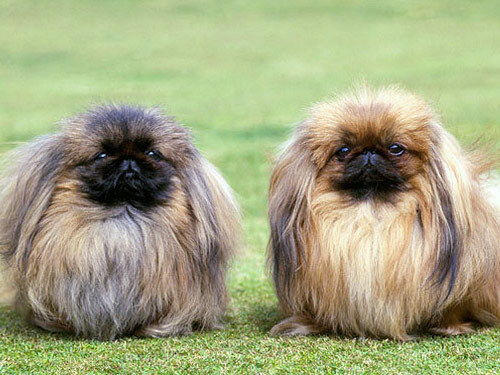 The Pekingese breed does not generally experience any major health issues which is wonderful. They do however, commonly develop skin fold dermatitis, KCS, patellar luxation, trichiasis, disticiasis and an elongated soft palate. On rare occasions, they can develop urolithiasis and the vet may recommend screening for their knees as they age. In some cases, corneal abrasions and sensitivity to anesthesia have been noted as well. The general lifespan of a Pekingese is from thirteen to fifteen years long. A small dog weighing in at around fourteen pounds when fully grown. The culture and history behind the Pekingese breed goes back to China where the Foo dogs were bred that resembled smaller versions of a lion. So much so that they were commonly referred to as "lion dogs." The Pekingese began being carried around in China by their owners inside their shirt sleeves as they were so small and portable that many referred to them as sleeve dogs. In 1860 this breed made it to England where one of them was given to Queen Victoria. They quickly became popular only with an elite or wealthy fan base and currently serve more of a purpose as a show dog or a small companion. They have also been known as the Peking Palasthund dog and have been around in China since the Ancient times.